I bought this lens with the Nikon D200 DSLR. After only two weeks, I absolutely love it. Other than my wide angle 12-24mm lens, this is the only lens that I will carry around with me now. I haven’t made any large prints yet, but the images look very sharp on the monitor, even when cropped and enlarged. Best of all, the VR really works as advertised. Although I was skeptical of Nikon’s claim that the VR is worth 3-4 stops, I’m a believer now. Turn off the VR, zoom to 200mm, and focus on something. Visible shake. Now turn on the VR and focus on the same object. The shake is noticeably less. Amazing. So far I’m 100% satisfied with this lens. I was using the Nikon 24-120mm VR as my regular lens, but I’m so happy with the 18-200mm lens that I’ve already sold the other lens. Some of the reviews you’ve read on the internet are a little over-hyped. And some of them, or at least some portions of them, are not. 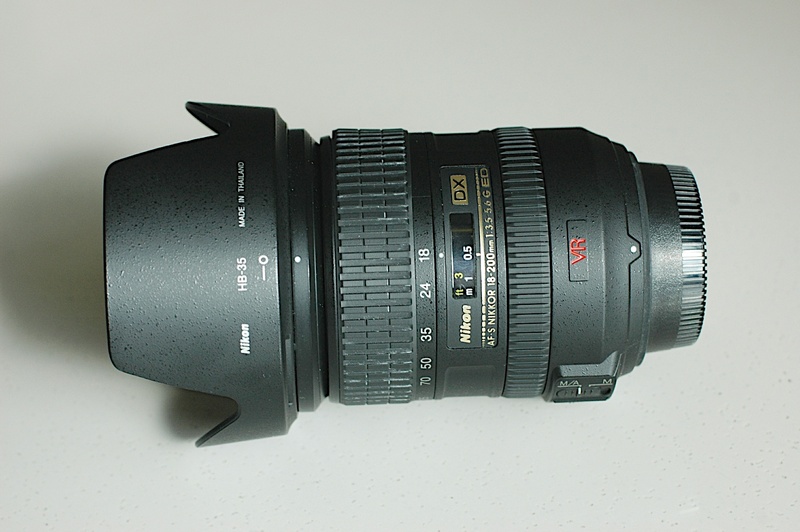 I’m using this lens on a D50… Great results so far. I am not going to go into detailed specifics of the distortion, since that’s been dealt with better by Ken Rockwell, Thom Hogan and others (EXCELLENT reviews… seek them out…). But it’s severe enough at the wide end that you will probably want to correct it (as best you can) in Photoshop. In real-life shooting, it isn’t a huge deal. (UPDATE: In real life shooting of hundreds of images so far, I’ve found NOT ONE SINGLE INSTANCE where I wanted to bother “fixing” it. I repeat… There is distortion, but it is NOT a problem.) I find that when I zoom in to 24 it is totally usable to all intents and purposes, and if I REALLY want to use something you shot at 18, unless there are some REALLY straight lines in it you might have no need of correction. So, in short, the distortion is there, but so what. It’s bound to be in a lens of this range. Some other reviewers report better resistance to flare than I am experiencing. It is still pretty good in a lens of this many elements, but it is hardly “nonexistent” as some have reported. (UPDATE! I have had only ONE image “ruined” by flare. It was pointed at the sun. Flare is excellent on this lens!) Mine is made in Thailand and earlier ones in Japan. I hope that I got the same quality as the lucky early adopters, but this could account for that difference. I still don’t use the lens hood because I step the filter threads up to 77 and don’t want to take off my UV filter ever time I use it. I actually find I can stack my polarizer on top of my UV (which is on a 72 – 77mm step-up ring – Curse you Nikon for not making the threads 77!) and STILL use this lens with no real vignetting at 24 and above. Now I REALLY want a 12-24, but that’s a whole other story (don’t have the dough). Now, I took two stars off for the distortion (necessary, I admit), and the slight chromatic aberrations I’m getting on slight over-exposures, and the reduced speed as you zoom out to 200, but it gets BOTH of those back easily for the INCREDIBLE VR technology and the fact that I have had NOTHING but excellent images come out of it. It kinda eats batteries for lunch compared with not using VR, but it’s still usuallly lasting me at least 300 exposures with an external SB600 as flash. (why haven’t you gotten a backup battery yet?!?). I actually shot some indoor 1600 stuff hand-held all the way at 200mm (300 equiv) and 1/40 or 1/50. AMAZING! I understand it works well in low light at the wide end too. Haven’t tried any available darkness landscapes yet, so I can’t say. It’s a great lens. Just buy it!